Legendary Denon quality and reliability. The DN-300CR is a professional, full-featured CD recorder providing the highest level of audio quality for broadcast, studio and entertainment applications. 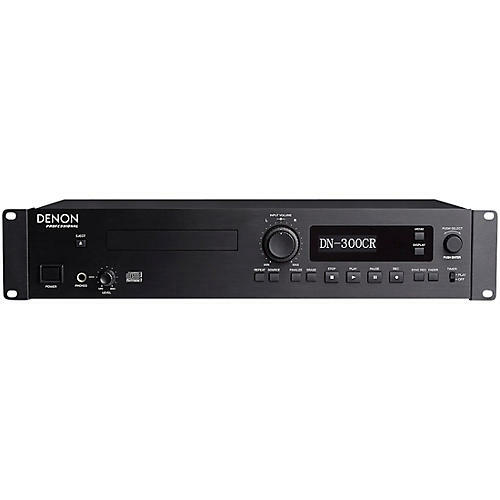 The Denon Professional DN-300CR combines top-flight audio performance, input/output flexibility, rack-mount utility and robust construction. It records on standard CD-R and CD-RW media, and CD text is programmed and read from the front panel OLED display. Features specified by the installation market include tray transport, programmable auto-track increment, level-dependent sync recording, and more. Featuring Denon Professional’s extensive experience in professional-level design and manufacturing, the DN-300CR’s performance specifications tell a large part of the story: With a frequency response over the ultra-wide bandwidth of 10-20kHz ±0.8dB playback and ±1dB recording, a signal-to-noise ratio of >95dB playback and >90dB recording and channel separation of >90dB playback and >80dB recording, the DN-300CR’s pure audio performance is beyond reproach—the very highest attainable audio performance that the present-day state of the art allows. In addition, the DN-300CR has two digital outputs (coaxial RCA and optical Toslink) for hookup compatibility with virtually all associated equipment, plus it supports practically any CD format: CD, CD-R, CD-R-DA, CD-RW, CD-RW-DA (CD-RW 24X supported). Provides the highest level of audio quality—order today.